The president, in Schnecksville, Pennsylvania, explained his view of jobs and the shape of the U.S. economy Friday. NEW: President vows to follow through on commitment "to whip the VA into shape"
He says country's best jobs report since December '07 is "in time for the season of hope"
But, he says, "we still have a long way to go," and one job lost is "one job too many"
Schnecksville, Pennsylvania (CNN) -- President Obama on Friday praised the latest jobs figures that show a drop in the U.S. unemployment rate from 10.2 percent to 10 percent in November. "I want to do something I haven't had a chance to do that often during my first year in office, and that is to share some modestly encouraging news on our economy," he told a crowd composed largely of students from Lehigh Carbon Community College. Official remarks released in advance by the White House did not include the word "modestly." Noting that the latest jobs report is the country's best since December 2007 -- which economists say marked the start of the recession -- the president added, "This is good news, just in time for the season of hope." But he added that "we still have a long way to go" and that one job lost is "one job too many." "The journey from here will not be without setbacks or struggles," the president said. "But the direction is clear. When you think about how this year began, today's report is a welcome sign that there are better days ahead." The president's trip to Pennsylvania was part of what the White House is billing as a "listening tour" on the topic of jobs. It comes on the heels of a summit the president held Thursday at the White House with leaders from various sectors of the economy. "We had frank discussions about a variety of ideas that helped refine our thinking," Obama told the crowd Friday. His remarks followed a visit to Allentown Metal Works, a local factory that has struggled for years, particularly in what Obama called the "brutal recession." In an exchange that drew laughter from the crowd, Obama took a question from a second-year student who said he has been studying criminology. "I was wondering if, maybe, if you checked out some of the statistics about legalizing prostitution, gambling, drugs and nonviolent crime in order to stimulate some of the economy," the student said. "That will not be my jobs strategy," Obama responded, smiling. But he praised the "boldness" of the question. "Part of what you're supposed to do in college is question conventional wisdom. And so you're doing exactly what you're supposed to be doing, which is, you know, thinking in new ways about things," he said. 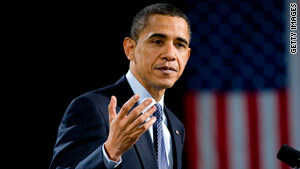 The president then launched into an extensive explanation of his view of jobs and the shape of the U.S. economy. Another man asked about the Post-9/11 GI Bill, saying that he is eligible but has not received benefits from it and has not heard back from the Department of Veterans Affairs despite having called the agency repeatedly. Obama vowed to follow through on his campaign commitment "to whip the VA into shape" and said that his own grandfather's college education was funded by the GI Bill. He added, "You shouldn't have to make a phone call. You should be able to get online. That would be more efficient. ... The fact that you're having to make the call tells me that we have not fully upgraded our information systems yet the way they need to be upgraded." And, he joked, "You went straight to the top here, so I suspect somebody will be calling you on your cell phone in about two seconds."